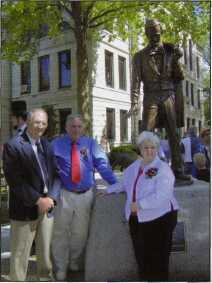 John McClarey (left) at the recent dedication of his statue "Last Stop," erected on the courthouse lawn in Taylorville. and maternal grandfather (both ministers), John McClarey flourished. By age ten he was producing formidable sketches of Lincoln, and his love of art continued throughout his school years, with frequent contributions to school newspapers and national art magazines. Although John did not major in art in college, his career as a sculptor and Lincoln enthusiast was energized by an encounter with Professor Lucy Tish at Illinois State University while he was studying for a master's degree in history. Her course on Edgar Lee Masters and Abraham Lincoln helped to provide the intellectual context for his later work, and his strong moral upbringing meant that spiritual values would also find expression in his bronzes. These combined influences allowed John to begin successfully marketing small-scale pieces (busts of Lincoln, family groupings) while teaching school in Cerro Gordo and later working for the Illinois Department of Commerce and Community Affairs in Springfield. Working in the state capital also gave him ready access to the Lincoln materials at the Sangamon Valley Collection, which he visited in the public library during lunchtime. One of John's smaller bronzes now forms part of the Henry Homer Collection at the Abraham Lincoln Presidential Library and Museum, and copies of his Freedom River sculpture of Lincoln are awarded annually to winners of the Richard Current Award presented by the Lincoln Forum in Gettysburg, Pennsylvania. John's major breakthrough, however, occurred in 1998 when he received a commission for a bust of Lincoln from the Russian State Library for Foreign Literature. Illinois commissions poured in, and John's Lincoln statuary began to dominate the already heavily populated field of Lincoln likenesses in central Illinois, including the John Gutzon Borglum bust at the Lincoln tomb, whose shiny nose has been polished by millions of visitors over the years. 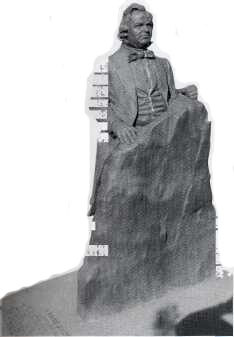 John's free-standing, outdoor Lincoln statuary includes Young Lincoln on a Log Bench (Vandalia), Vision for a Greater Illinois (Decatur), Lincoln Draws the Line (Peoria), Deputy Surveyor of Sangamon County (New Salem State Park), A House Divided (Charleston), and Last Stop (Taylorville). Perhaps his finest piece, A Greater Task, will be dedicated later this year in Union Square next to the Abraham Lincoln Presidential Museum. That statue will have heroic proportions, measuring over thirteen feet high, including its base. It depicts Lincoln as he prepares to leave Springfield in 1861, an imaginary wind of controversy causing him to clasp his bronze coat lapel with his right hand while his left pushes against the powerful forces of rebellion. The bottom of his coat flaps furiously in the breeze. McClarey's Lincoln statues are conceived around such symbolic details, making his work a beguiling combination of realistic details (buttons, boots, neckties, and hats) and subtler implications. For example, mapping plays a symbolic part in the Decatur and New Salem statues. Lincoln is shown at the entrance to New Salem village with his surveying gear, laying out towns such as Petersburg while seeking his own place in the larger scheme of things. In the Decatur statue, Lincoln studies a map of central Illinois, which, as a good Whig, he sees as a land of infinite possibilities, especially once turnpikes, railroads, bridges, and canals would create a beneficial infrastructure. The statue speaks to the themes of progress and future development, and even though it is made of heavy bronze, it dramatizes Lincoln as a seer and visionary who helped to shape the state of Illinois. McClarey's statue of Stephen A. Douglas from "A House Divided," which stands on the Coles County Fairgrounds in Charleston. and their gesturing arms and hands take on special meaning. Both Lincoln and Douglas stand behind parts of a bronze boulder that have been split in half. McClarey intended the viewer to sense both the divisiveness in the air of 1858 but also a willingness to debate the issues in a rational and civilized manner that is at the very heart of democracy. A House Divided is a complex and highly moving piece of art. John's latest Lincoln effort, Last Stop, was dedicated on the courthouse lawn in Taylorville on a beautiful Saturday afternoon, May 28, 2005. The statue is based on a local legend. Taylorville was Lincoln's "last stop" on the Eighth Judicial Circuit. The story goes that Lincoln humorously petitioned his friend Judge David Davis for a Writ of Quietus so he could shoo the grunting pigs from under the log courthouse and restore "quiet" to the proceedings. After a certain amount of indecision by a local planning committee and a surprisingly generous offer to underwrite the project by a local real estate developer, Monte Siegrist, the design finally took form. McClarey shows a very human Lincoln, with none of his usual gravitas, ambling along, frock coat dangling over his left shoulder, a little piglet trotting at his side. The point is not the historical accuracy of the pig incident itself but the larger pattern of humility, humor, and political agility that marked all of Lincoln's career. The statue also demythologizes Lincoln, and many of the dignitaries at the dedication ceremony remarked that Lincoln was coming home. The whole afternoon had a distinctly Midwestern quality to it, with a local folk-singer crooning "The Ballad of Mr. Lincoln and the Pig," collectors driving their classic Lincolns around the square, children dancing a "pig jig," and volunteers serving ice cream, lemonade, and Mr. Lincoln's favorite white cake. When asked if Last Stop was his favorite statue, John McClarey thought for a moment, then replied with a twinkle in his eye, "They are all my favorites." Dan Guillory is Professor Emeritus of English at Millikin University in Decatur. He is the author of four book, including Living With Lincoln: Life and Art in the Heartland. He is currently working on a book about Lincoln sites in central Illinois.